This page gives examples of the various image features seen in data taken with the warm IRAC instrument. There is a separate page for Cryogenic IRAC image features. Most of the artifacts discussed here are seen in either BCD or CBCD images and not in the mosaic, although sometimes a feature can carry on to the mosaic, especially if the observation did not use large enough dithering. Residual images are still seen in warm IRAC data. 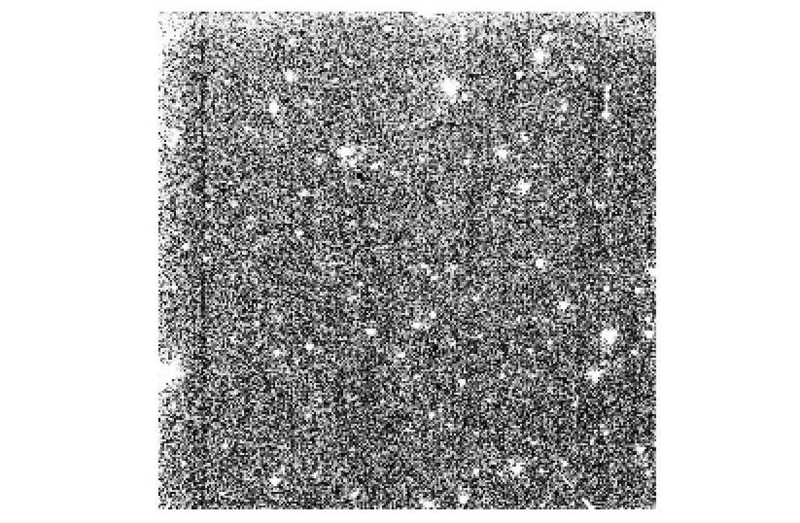 The behavior of residual images is somewhat different from the cryogenic mission residual images. We are currently tracking the behavior of residual images and will post updates here as soon as they are available. Several kinds of residuals are seen, in both channels. The residuals can be negative or positive, compared to the background. They are always triggered by a bright source on the array. The column pulldown may also leave residuals, which may be negative or positive (the latter usually in channel 2 and appearing in only a few subsequent frames). 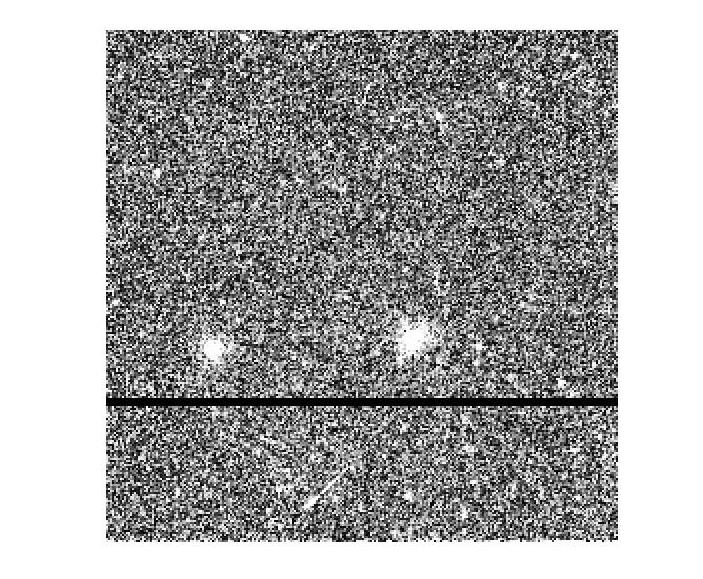 Another class of residuals consists of slew residuals, which are linear tracks (positive or negative) left behind on the array by a bright star that was in the field of view while slewing the telescope between target positions. The Spitzer Science Center is paying particular attention to (slew) residuals affecting calibration observations and discarding calibration data that are affected by persistent images. 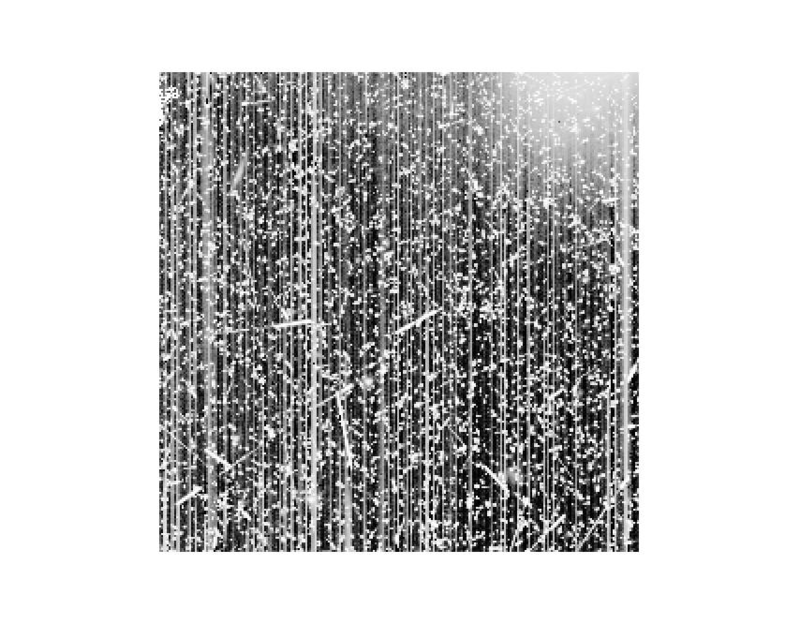 In no case has a residual been seen to persist for more than two weeks, and they are generally more prevalent in channel 1 images which has a broken clamp (this was thought to be the reason for persistent channel 1 images in the cryogenic mission). Below we show several examples of residual images (however, there may be other varieties as well). Mitigation: If the observation is fairly short and consists of at least half a dozen frames per AOR, and there is large enough scale dithering, and the residual image does not change its intensity considerably during the observation, it may be possible to get rid of the residual by subtracting the average or median image made of all the frames of the same frame time within the AOR from the individual frames. In long observations where the residual is clearly decaying during the observation, it is better to divide the observation into perhaps ten frame sections and form medians for those frames and then subtract them from the corresponding individual frames. Narrow column pulldown residuals may be removed with fitting tools under contributed software. 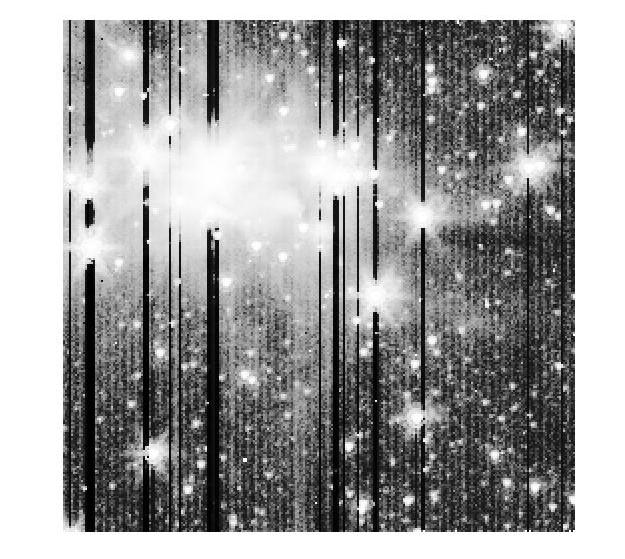 Example sequence of positive residual images in a mosaic of the central region (about 90x70 pixels) of the channel 1 array, resulting from a bright star observation there. The frames only show the central region of the array, not the whole array. This is a sequence of successive 100 second images with medium-scale dithering in position (time increasing from left to right and top to bottom), shown using the "Histogram Equalization" scale/contrast. The residuals show up us brighter features than the darker background. The same residual as above in the median image, showing the whole frame. The image is in "Histogram Equalization" scale/contrast and the residual image pixels are brighter than the darker background. Slew residuals (bright streaks) are also seen. 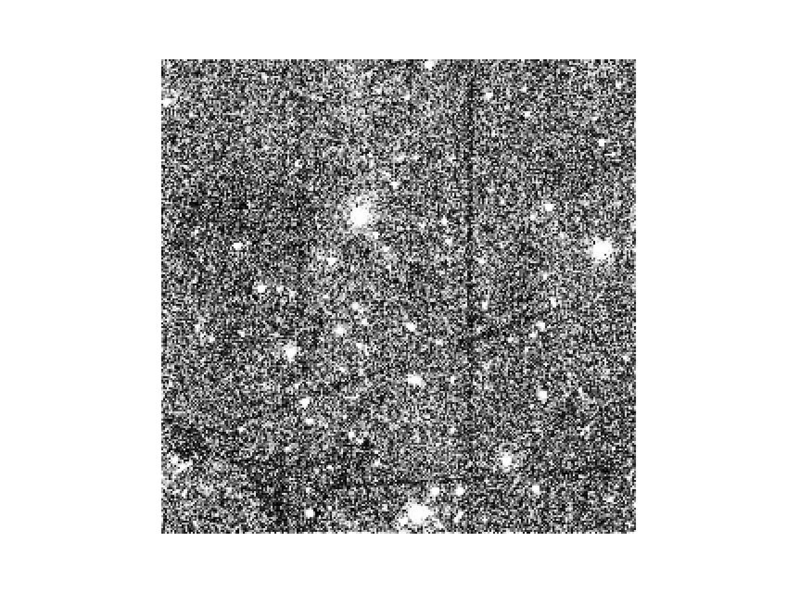 Example of a residual pattern left behind on a CBCD frame after slewing a bright (Kmag = 1.8) star on the channel 1 array a few minutes before this observation. The image is shown in "Histogram Equalization" scale/contrast, and the residuals are the bright streaks compared to the background. Example of a rarely seen dark residual pattern on the channel 2 array. The image is shown in "Histogram Equalization" scale/contrast and the residuals show up as darker patches than the overall background in the image. The white patches are mostly astronomical objects. Example of a positive diffuse residual in a channel 1 mosaic made of 12 second frames in an HDR observation. Red arrows point to the residual patch that is brighter than the surrounding background. 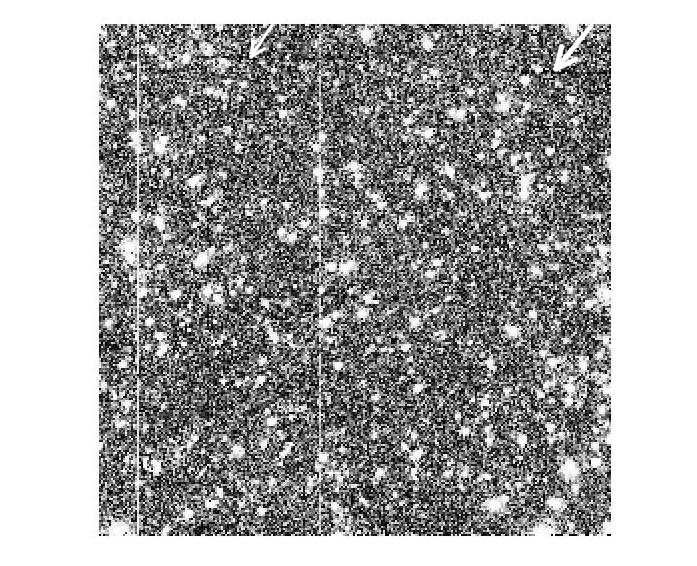 The other bright objects are mostly astronomical objects (stars and galaxies, including the large galaxy image on the right). The image is shown in "Histogram Equalization" scale/contrast. Examples of negative slew residuals (horizontal, diagonal) in the bottom half of the array. Negative column pulldown residuals (vertical) are also shown. The image is shown in "Histogram Equalization" scale/contrast and the slew residuals show up as the darker streaks against a brighter overall background. An example of a positive slew residual. The image is shown in "Histogram Equalization" scale/contrast and the slew residual is the bright streak across the bottom half of the image. The other bright patches in the image are for the most part astronomical objects. An example of a positive residual near the center of the array left by a Reuleaux pattern dithering of a bright star in channel 1. The image is shown with "Histogram Equalization" scale/contrast, and the residual is the triangle-shaped feature that is brighter than the surroundings near the center. The other bright patches are mostly astronomical objects. Residual bias pattern shows up in the top rows (which are the first rows that are read out) of the first (C)BCD frames taken with a long frame time (12 - 100 seconds) AOR in channel 1 only. It is usually negative, but positive residuals have also been seen in the warm data. Residual bias pattern in top rows is part of the first-frame effect and is due to an imperfect bias correction (see the IRAC Instrument Handbook Section 5.1.10 for a more detailed discussion of the first frame effect). 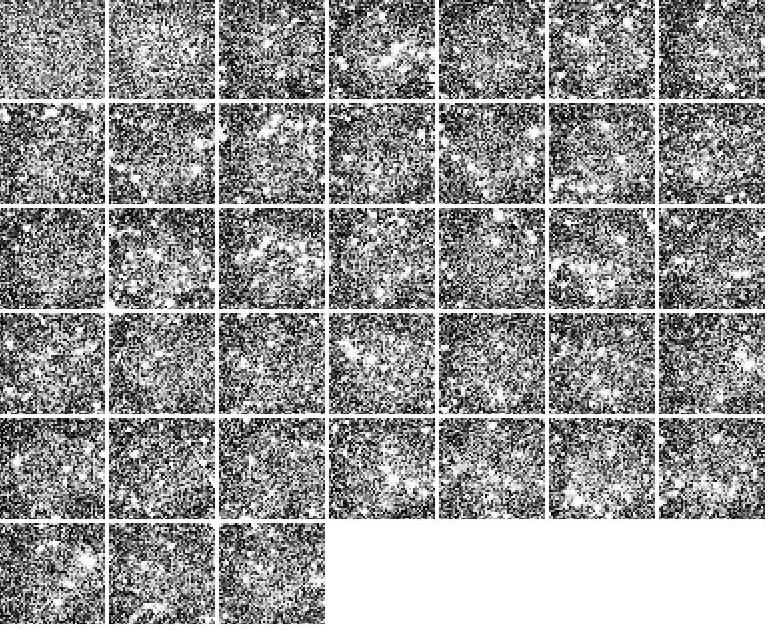 Mitigation: When observing dozens of frames and making a mosaic, the effect of the residual bias pattern is diminished. 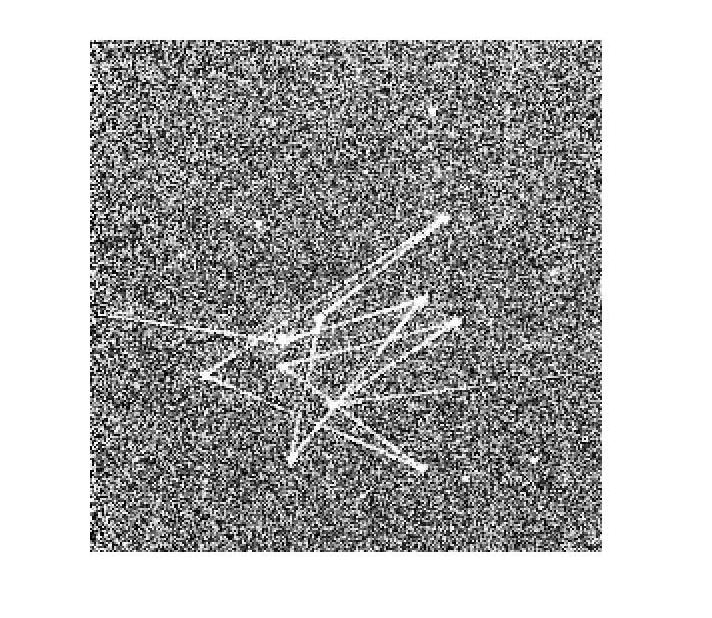 Users may write their own software tools to correct for residual bias patterns while making ``pretty pictures.'' However, scientific measurements of targets under the bias pattern affected areas are not recommended. Example of a negative residual bias pattern in the top rows. The image is shown in "Histogram Equalization" scale/contrast, and the residual bias pattern can be seen as the almost black feature in the bottom rows and upper corners of the image. The bright patches in the image are astronomical objects. Example of a positive residual bias pattern in the top rows. The image is shown in "Histogram Equalization" scale/contrast, and the residual bias shows up as a fuzzy, brighter than the surrounding background, feature in the top rows and upper corners of the image. Sometimes an energetic plasma cloud from the Sun is hitting Spitzer, making the data taken during those periods next to useless due to a very large amount of cosmic ray hit pixels and subsequent column pulldown. Mitigation: One can try to throw away the worst hit frames and try to make a mosaic out of the (C)BCDs. One can then judge from the final mosaic whether the data are usable or not. The Spitzer Science Center Helpdesk should be contacted if the data are useless (within two months of the observation) so that a reobservation can be arranged. 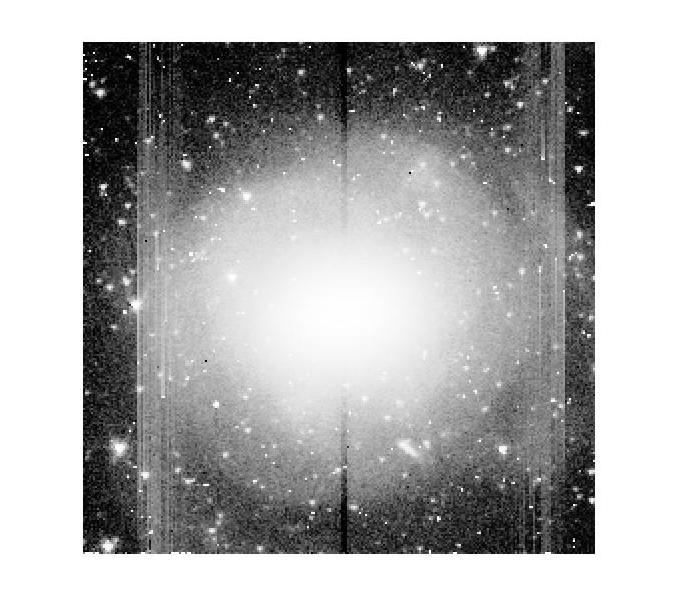 An example of CBCD data with lots of cosmic ray hits and column pulldown. 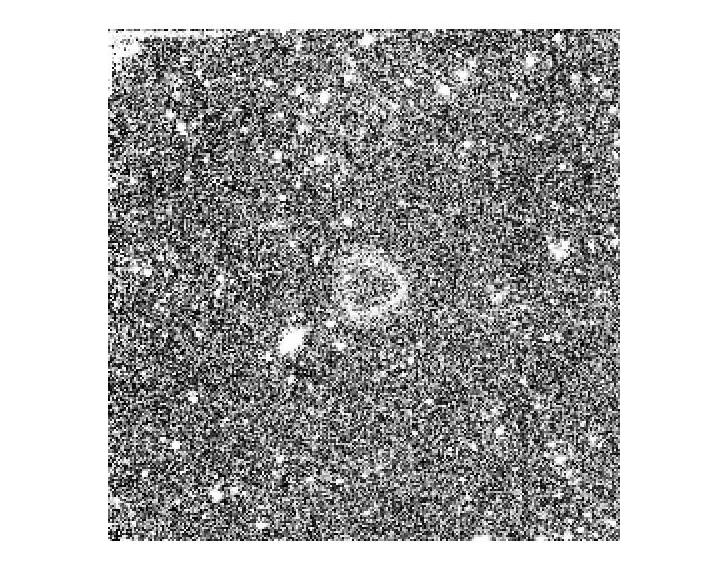 The image is shown in "Histogram Equalization" scale/contrast, and most of the small bright patches are cosmic rays. The fuzzy, extended object near the upper right corner is an astronomical object. The column pulldown residuals show up as bright vertical lines. On occasion, but rarely, not all the data are retrieved from the telescope. These can manifest themselves as, for example, missing lines of data in the (C)BCDs. Mitigation: There is nothing that can be done to retrieve the missing data. Depending on the science, the data user is advised to either disregard the affected frame(s) from data analysis or if the science target is not near the missing data, use the rest of the frame. An example of missing data rows. The image is shown in "Histogram Equalization" scale/contrast. The missing data rows show up as black lines in the bottom half of the image. The bright patches are astronomical objects. 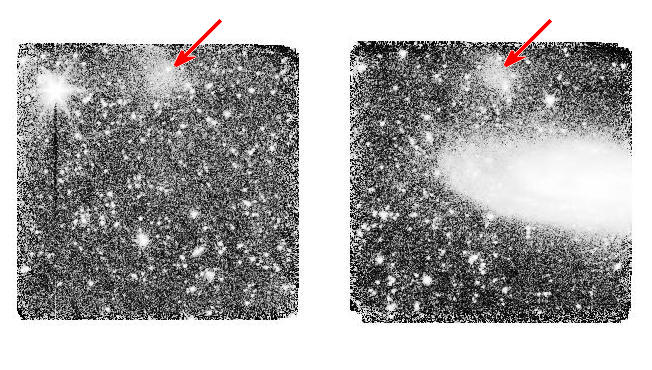 The column pulldown corrector in the IRAC pipeline can be fooled to overcorrect in fields of high star density or in regions of extended high surface brightness with sharp boundaries. Mitigation: The best mitigation is to use the BCD image instead of the CBCD image, and perform a manual overlap correction of the features judged necessary using the contributed software. An example of too aggressive column pulldown correction in channel 1 in a field of a bright, extended object with a rather sharp edge. The incorrect column pulldown correction shows up as vertical bright lines, especially near the left and right edges of the image. The extended bright object in the center is a galaxy, and the bright patches are mostly foreground stars and background galaxies. The image is shown in "Histogram Equalization" scale/contrast. An example of too aggressive column pulldown correction in channel 2 in a field of bright stars. The overzealous column pulldown correction shows up us a pattern of bright vertical stripes across the image. The image is shown in "Histogram Equalization" scale/contrast. Recently an example of broad positive bands of columns were seen in both channels 1 and 2. This artifact appears to be rare. The reason for this is under investigation. 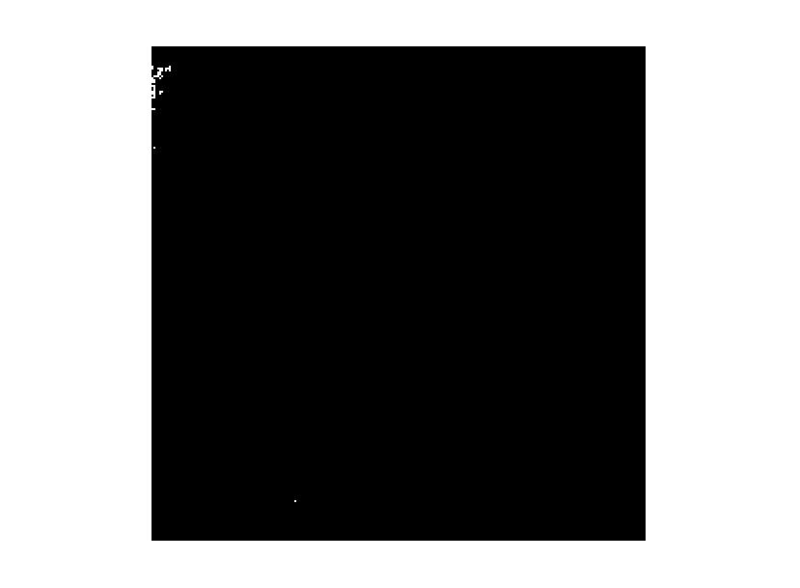 Mitigation: Currently there is no recommended mitigation, although subtracting median images may help to remove this artifact. 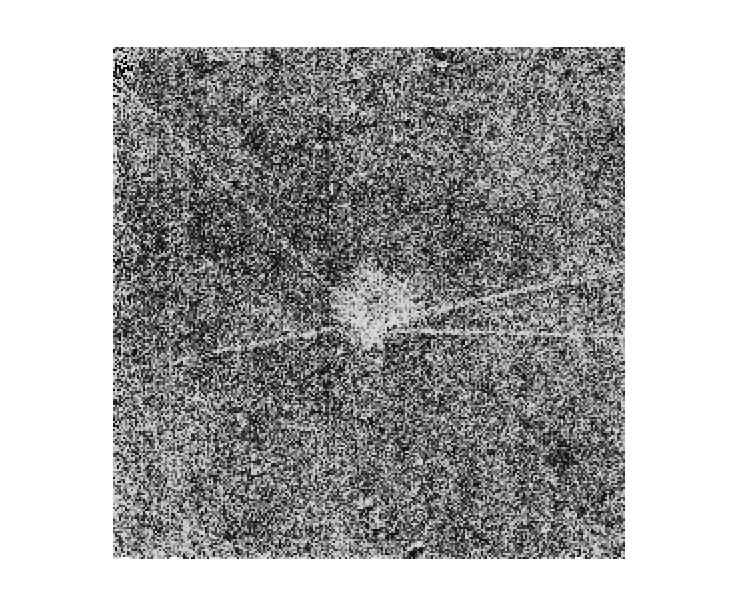 An example of a channel 1 mosaic with broad bands of positive (above background) columns to the right of the center of the array. The image is shown in "Histogram Equalization" scale/contrast. The positive broad bands show up as slightly brighter extended features covering several vertical columns from top to bottom to the right of the center of the image. The other, more pointed bright features, are mostly astronomical objects. Also recently, long negative bands of pixels were seen near the top rows of channel 2. This artifact appears to be rare. The reason for these features is under investigation. Mitigation: Currently there is no suggested mitigation for these features, although subtracting a median of all frames may help. An example of horizontal negative bands in a channel 2 CBCD. The image is shown in "Histogram Equalization" scale/contrast. The horizontal negative bands show up as darker horizontal features than the background and are pointed to by the white arrows near the top of the image. 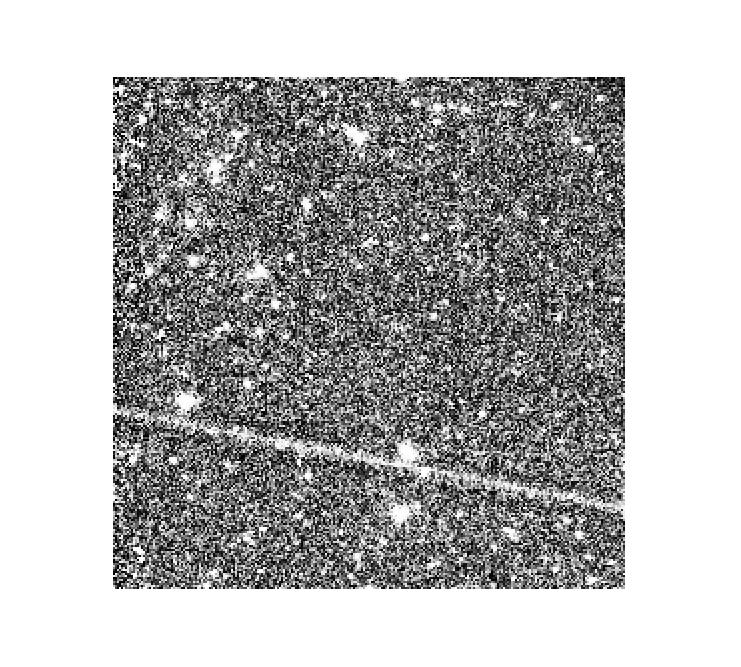 The bright patches in the image are mostly astronomical objects and the vertical bright stripes are column pulldown residuals. 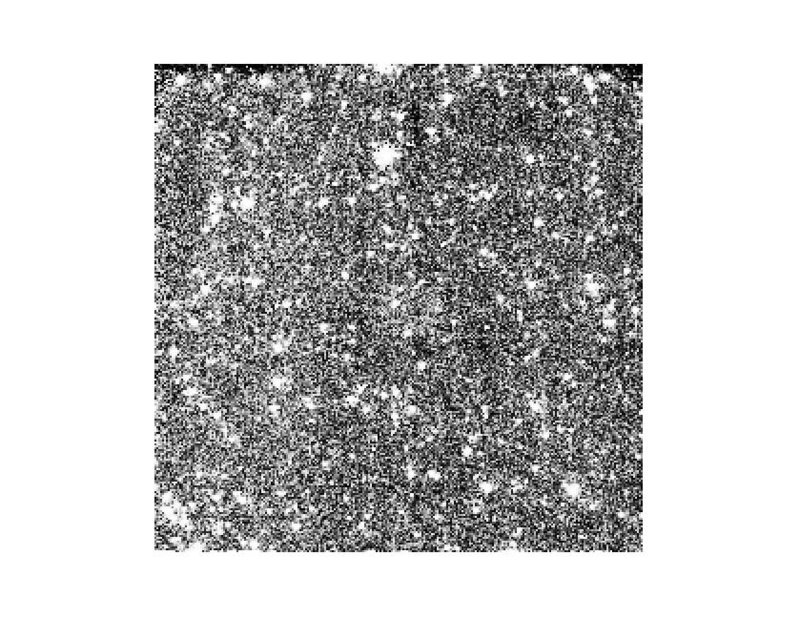 Sometimes channel 1 (C)BCDs show a cluster of NaN-valued pixels near the upper left corner. Mitigation: Currently there is no mitigation for this artifact. The NaN pixels have to be ignored in data analysis. 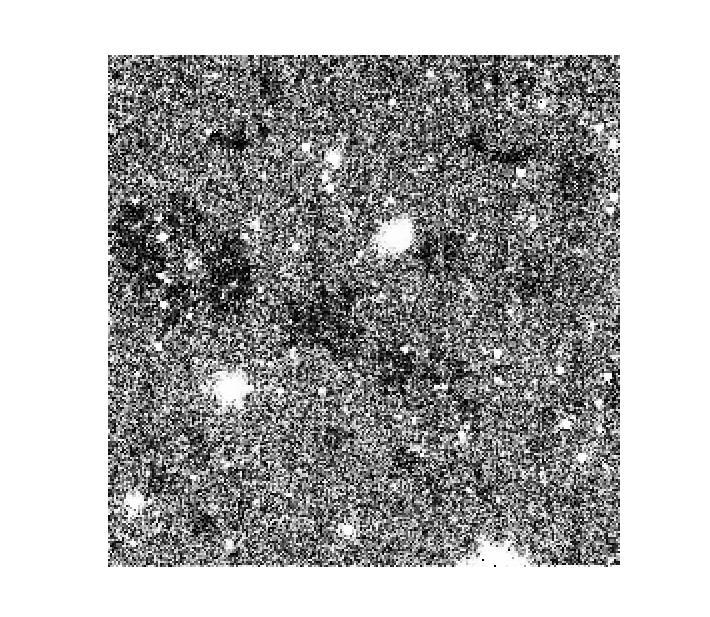 An example of a cluster of NaN-valued pixels near the upper left corner of a channel 1 CBCD. The image is shown in logarithmic scale. The NaN-valued pixels show up as bright features near the upper left corner. Often several NaN-valued pixels are found on the bottom row in the (C)BCDs, especially in channel 2 (but sometimes also in channel 1). These are presumably introduced by the pipeline while performing the dark subtraction. Sometimes the column pulldown corrector in the pipeline does not get a good fit near the peak of a bright star, and the correction will produce a very negative pixel (or pixels) close to the peak of the star (the values can be hundreds or even thousands of MJy/sr negative). These very negative pixels can only be detected by looking at the values of the pixels (for example, when displaying images). Mitigation: In such cases, the user can copy the original pixel value from the BCD if the offending star is of interest.